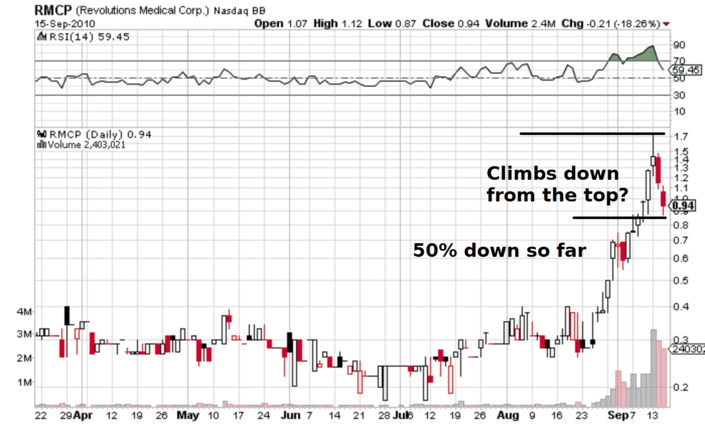 Home > Hot Penny Stocks > Revolutions Medical Corp. (OTC:RMCP) The Rapid Climbing Down Starts? After Revolutions Medical Corp. (OTC:RMCP, RMCP message board) stock has reached new highs recently, now the rapid climbing down seems to have started. The stock looks like it is about to prove that the upward move has been speculative. The intensive shorting from last week keeps going on, implying that there are still buyers who believe in a lasting appreciation. Though, the percentage of shorted shares declines this week and was quite inconsiderable yesterday, meaning that the rise of the stock price might be over for now. With two large jumps downwards RMCP share price is losing progressively the recent gains. Yesterday, the stock fell down by another 18.26%, closed at $0.94 and 2.4 million shares were traded. There are no updates on the company since the last ones from last week. Then, the company filed that it had entered into an agreement for the manufacturing of its one and only marketable product, the RevVac Safety Syringe. Immediately after that, the company announced in a press release the much less probable news that the US Department of Defense will be the first one to place a purchase order for the approved by the FDA already in February last year product. As no corresponding SEC filing has followed so far, it seems that the shorters are the ones that could make their profits from the initial excitement on the market. RMCP is under-financed and will in any case need to raise cash in order to be able to fund the production of the safety syringe, for which there are currently no management estimates about expected revenues, costs and eventually the expected profitability. All that makes it probably still too early for their share price to jump up. Strangely, RMCP has another FDA-approved technology, a breast biopsy localization system, which the company has also not managed to market yet and is currently attempting to get a patent and to license that technology.